Slayer have released a new video where they look back at some of their favourite band-related merchandise. It’s the latest in an interview series where they’ve been looking back on their legendary 37 year career as they prepare to call it a day. In the new video, the band chat about everything from snow globes and beer steins, to Slayer-branded skateboards, album packaging and bikes – and their relationship with Vans. Scion's epic Slayer-inspired car from 2014 also gets a look in. 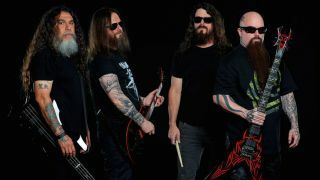 Slayer will head out on the next leg of their farewell tour across North America with Lamb Of God, Amon Amarth and Cannibal Corpse throughout May. They’ll then return to Europe for further show this summer, including sets art Sweden Rock, Download UK, Graspop Metal Meeting and Hellfest.